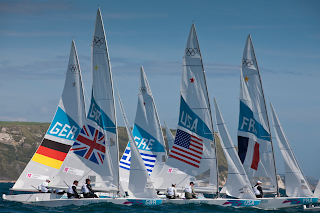 The first day of the Olympic Regatta has come to a close at the Sailing venue in Weymouth, UK, with races completed in the Star, Finn, and Women's Match Racing classes. The windsurfers are scheduled to start on Tuesday, giving us just one more day to relax and get organized before our event begins. The American windsurfers (Bob Willis and I) are on track with our training and resting schedules, and we've settled into a nice routine. The Star fleet prepares for a start. A daily routine is something sailors create during each event and training session, which minimizes logistical complication and allows us to navigate through each day in a familiar pattern. Much of the routine of the Olympic Games is the same as usual, and I've settled into village life and pre-regatta prep normally. However, as the regatta commences, a few things are markedly different. Security is the main focus of this event and our sailing area is significantly smaller. White buoys mark the edges of the course areas, and are a boundary competitors can't cross, whether it is sailing out to a racing area or during the race itself. Security boats patrol the harbor and boundaries and only accredited coaches and sailors are allowed into the zone. In our venue, British commando soldiers guard the entry and exits, and search all people and vehicles entering. The security creates a delay to our routine, and extra time is needed to get in and out of the venue. 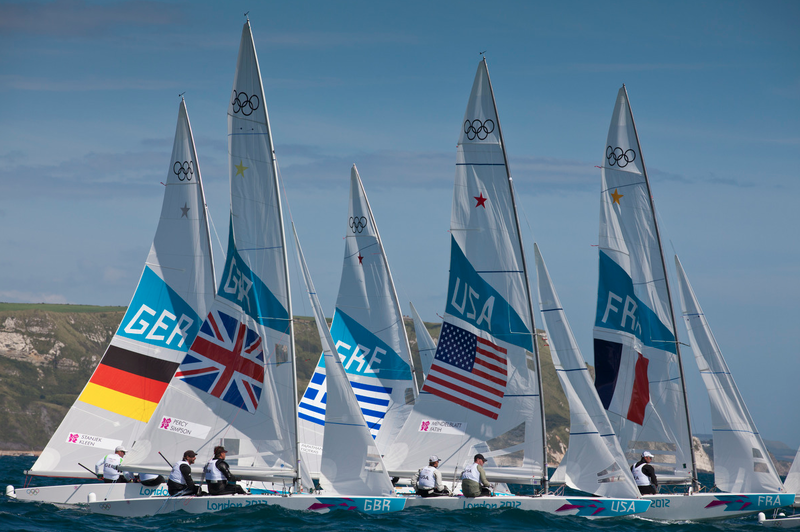 One other strict time restriction occurs to sailors after racing. Instead of the normal process of derigging, sailors need to return tracking devices, get their credentials back (they are collected before racing) and walk through a chute in the press area, where reporters can ask questions. Not completing these steps can result in a severe penalty; during this event, there are many ways sailors can get extra points added to their scorecard. A few other restrictions include forced retirement from a race after an OCS (early start), launching regulations, and strict rules for the provided equipment - adaptations to the gear permitted in the RS:X class rules aren't permitted here, even simple things like sanding down the boom grip. Aside from the regulations and security, I'm finding everything else quite simple. I'm pleased with the setup for the windsurfers at the venue (a tent with padded carpet to rig on), and my provided equipment is surprisingly decent. The new board is light, and I have a good fin, which will make all the difference. The venue is much more mellow and quiet since the Olympics are actually a smaller regatta than a normal World Cup event; the quieter environment suits me well. Our Olympic village is more mellow as well, and after seeing how crazy the London village is, I'm really happy we are competing at a satellite venue. After driving up for the opening ceremony on Friday, it took me a day and a half to get decompressed from the craziness! I'm really excited about beginning our event and I'm in a positive frame of mind. I feel relaxed and focused. I'm not the most experienced athlete in the fleet but I've been putting together great races, and I've got a great psychological plan. I'm on my way to the top and this is just another step on the way up. I want to thank my great sponsors, Compass Marketing, the St. Francis Sailing Foundation, the Olympic Sailing Association at New Orleans, and the Annapolis Yacht Club Foundation for making my progress in this sport possible. I'm proud to represent you and all my friends back home. Go Team USA! !